What is a Dynamic Text? The text that can customize or change is termed as "Dynamic Text". The message will be conveyed dynamic from one visitor to the other as mentioned in the defined rule. The dynamic text will be auto-populated when the "%" symbol is typed along with the message. %visitor.name% Name of the visitor in the website. %visitor.id% Reference ID for the visitor in the website. %visitor.email% Email Address of the visitor in the website. %visitor.phone% Contact number of the visitor. %visitor.department% Name of the department to which the visitor has initiated the chat. %visitor.question% Question raised by the visitor while initiating the chat. %visitor.ip% IP address of the visitor visiting the website. %attender.name% Name of the operator attending the chat. %visitor.pagetitle% Title of the page, from where the visitor has initiated the chat. %visitor.pageurl% URL of the page, from where the visitor has initiated the chat. %visitor.referrer% Source from where the visitor is referred from. %visitor.state% State/Province of the visitor located in. %visitor.city% City of the visitor located in. %visitor.country% Country of the visitor accessing the website. %visitor.timezone% Time zone of the visitor accessing the website. %visitor.latitude% Latitude of the visitor. %visitor.longitude% Longitude of the visitor. %visitor.operating.system% The operating system used by the visitor. %visitor.browser% The browser used by the visitor. %visitor.browser.version% The browser version used by the visitor. %web.embed.name% The web embed where the visitor has initiated the chat. %platform% The platform used by the visitor's in their system. %screen.resolution% Screen resolution of the visitor's system. %search.engine% Search engine used by the visitor to reach the website. %search.query% Search Query (Keyword)used by the visitor to reach the website. %attender.email% Email address of the attender who attends the chat. %smart.timenow% Timeperiod in the sequence of the day (Eg. Morning, Evening). The canned message is used to store the frequently typing text to save the operator time and improve the chat quality. 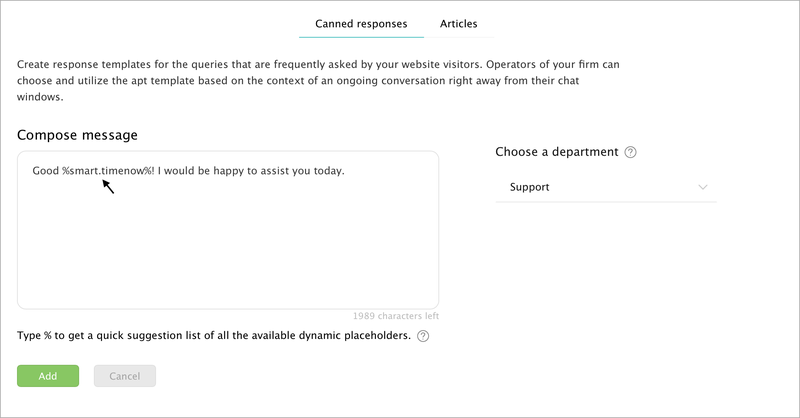 Navigate to Settings-> Templates -> Canned responses, click on the Add option to create a new canned message. Then type the message you would like to store in the Compose message section. To include the dynamic text in between the message then type %, the auto complete option will list all the options that are available. Choose the appropriate option. Choose a department and hit Save. Note: The same can be used in embed configure messages and APIs. To store a greeting message with the time period of the visitor. Click Add on the canned responsemsection, enter the message along with the %smart.timenow%! now dynamic text, and click on the Save button. When displayed to the visitor, the time period of the visitor will be calculated and the message will be customized accordingly. How to use Dynamic Text in Response messages? Navigate to Settings > Websites > Website Name > Live chat Widget. In the Chat window > Response Message section, click Edit on the message you wish to include the dynamic text. Typing the % in the message will list all the available options in the dynamic text. Choose an option, complete the text and click on the Update button to save changes. 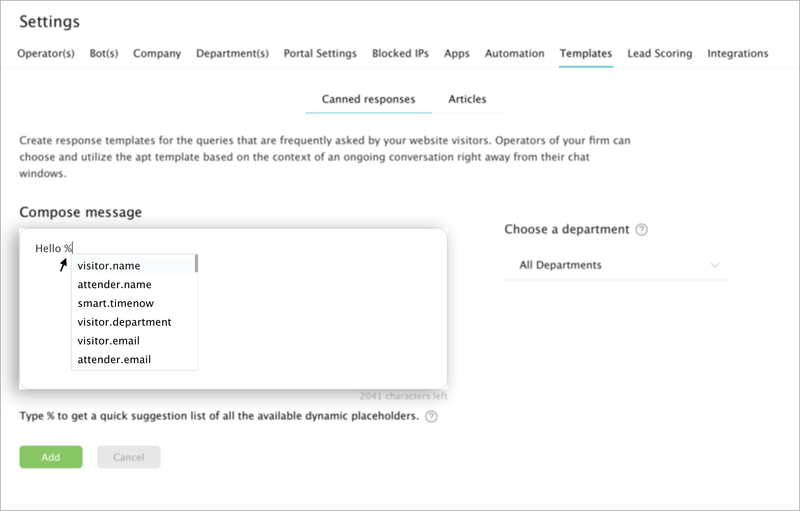 Navigate to Settings -> Automation -> Intelligent Triggers > Add, set a name for your rule and then choose a website from the drop-down. Then, set a rule with the criteria and condition. Now choose the Send chat invite option in the actions drop down, then in the from message enter the name or the company name from which you would like to send the chat invite. Then in the message section, enter the appropriate message you would like to send along with the invite. Here by typing the % will list the dynamic text options available, choose and option and complete the message. In this example, I've set %visitor.name|there% . So, if the visitor name is identified then it will be displayed, if not then "there" will be displayed in the greeting message.